Hi everyone! 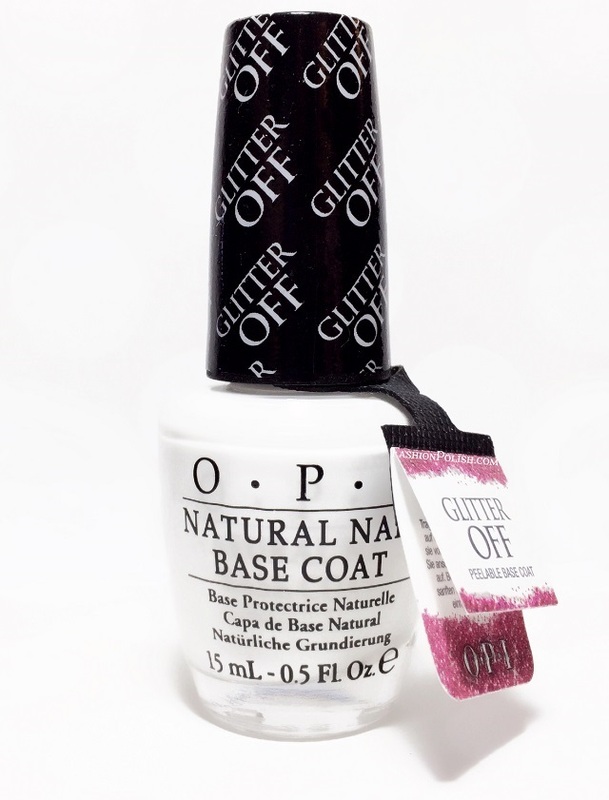 Today I have the OPI Glitter Off base coat to show you! 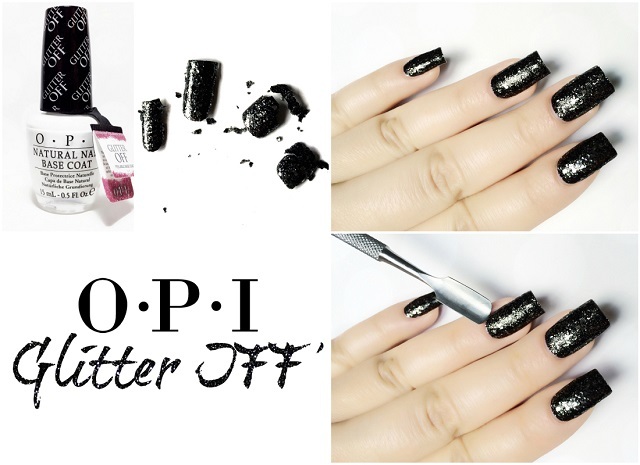 If you're anything like me, you rarely wear your glitters because, let's face it, they're such a pain to remove... Well OPI has just released a new peel-able base coat that promises quick, one step, removal. Let's see about that! To test the OPI Glitter Off base coat, I pulled out my worst nightmare of a glitter, the one that I have a love-hate relationship with : Metallic 4 Life from the Nicki Minaj collection. Different sizes of silver metallic pieces in a black base, fully opaque in 2 coats, gorgeous but with the hardest removal ever! The base coat itself applied nicely and evenly. First milky white and then drying to a semi-matte transparent finish, I found it much easier to work with than Elmer glue and definitely more fast-drying. It didn't seem to interfere with polish application or caused any problem with total dry time, topcoat included. I kept my manicure for about 24 hours before trying to remove it. During that time, I showered, cooked, cleaned and basically did everything I'd do on a normal day. All pictures in this post were taken on day 2. So after 24 hours without loosing any random/unwanted pieces, I took out my favorite stainless steel cuticle pusher (favorite because it has a sharp spoon end) and started lifting off the polish on all sides of my nails, slowly making my way to the middle. I found the process extremely easy on the nail beds but as soon as I got to the free edge, it got harder and harder. I still managed to peel the whole thing off on my pinkie and ring fingers but gave up on both middle and index because I was too scared to damage my nail plates. I have mixed feelings about the OPI Glitter Off base coat. It's not the revolutionary product I had hoped it would be but I will still be using it whenever I feel like wearing glitter polish because it still drastically reduced removing time. I'm pretty sure results would vary a lot depending on the glitter used and/or personal body chemistry though. I think people with shorter nails could get great results. Oh and I've also thought about sandwiching it between regular polish and a glitter topper. That could work, right? So what do you think about this new base coat? Have you tried it? Would you?